Stock photo agencies have different selling models, that can modify (reduce) the cost of the images you buy. Some agencies let you buy photos paying per item. And some also offer stock photo subscriptions, a plan that entitles you to a larger number of images during a time frame, for a fixed, periodic fee. Most top agencies include both options in their offer. Each buying system has it's pros and cons, and the convenience of one over other depends mostly on your particular needs. Download dozens to hundreds of images per month or year, for a flat monthly or annual fee. Access to collections not available to individual photo purchasers. Subscription lengths of 1 month to 1 year, enabling flexibility based on project scope and stock photo needs. Low, medium, and high resolution images available. Choose different subscription levels depending on image resolution requirements. For example, some companies offer web res and print res subscriptions at different price points. Price as low as fractions of a dollar per photo. Hassle free Royalty-free licensing terms. Stock photo susbcriptions are the best solution if you use lots of images every month, especially if you are under a tight budget or simply want to save money. With a subscription you assure the access to all the photos you will need, as well as the lowest price possible. Monthly and annual plans give you the best deal in pricing, with images at only a few cents each. Of course, this implies a commitment with the agency, as you agree to pay periodic fees. As many photos as you want, paying as you go. Low, Medium and High resolution available. Control how much to spend and when. No periodic fees nor extra liason with the agency. Price for a single photo depends on image resolution and content value. Some agencies price their assets in USD, but others use credits, a proprietary currency unit: they price their images in credits, and then sell you the necessary credits for you to buy the images. Depending on resolution, single stock photos cost between $1 and $15 in average. But most companies have discounts for bulk purchases. Whether it's image packs or credit packs, they all reduce single image price if you agree to buy more downloads at once. This means that the more you are willing to spend upfront, the more money you'll save in the long run. Single image purchase system is good enough if you're only looking for a handful of photos every now and then. It's also convenient if you don't want to commit long-term to an agency. If you don't want to be billed periodically and you prefer to control exactly when to spend money in stock photos, then this option is best for you. This agency is specifically aimed at small and medium sized businesses, and all their offers are thought to bring flexibility and low prices to fit in all budgets. They have image packs to buy on demand, starting at 5 images for $39, which turns out at $7.80 per photo. The lowest on demand price is of $3,60 per unit, with the largest, 100 images pack. They thrive in subscriptions too. Their exclusive 99club plan is a star product, offering 200 images for only $99 a year. This plan –which gives you photos up to XXL size for only $0.49 each– works on an annual download limit, adding great flexibility for small budgets. Plus, they have monthly download limit plans starting at 25 images for $35, and up to 500 downloads for $105. The largest plans, for 50 and 500 images monthly, can also be hired on an annual basis, for $550-$999 respectively. Like this, you can buy photos for between $0.16 and $1.40 each! They divide their pricing structure by quality and collection, not image resolution nor size. They have a top tier for exclusive, higher-valued photos, but also a lower-cost, non-exclusive collection. For single image purchasing, their non-exclusive images are 1 credit each, representing from $12 to $8, depending on the size of the credit pack you buy. Their subscriptions giving access to the whole library have from 10 and up to 750 images per month. Prices are between $100 to $399 monthly, and between $70 and $319 a month annually. This means image price falls between $10 and $o.43 each. And consider these subscriptions include exclusive images. Plans for non-exclusive content only are even cheaper. See more in our iStock overview. 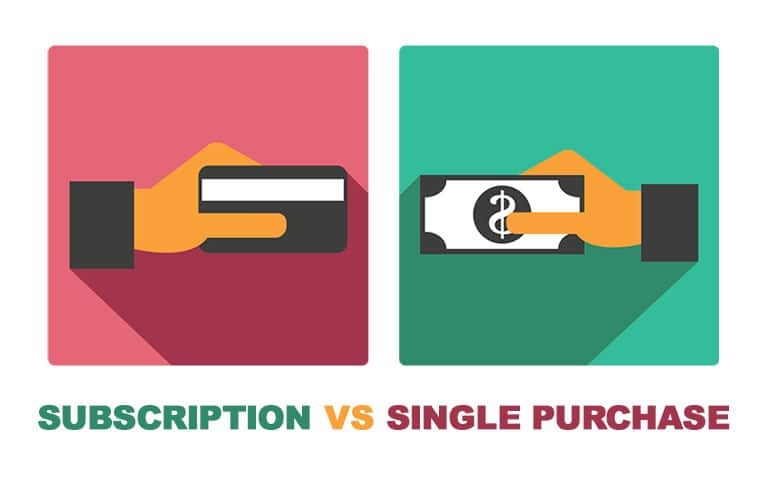 They work with subscriptions only, but they have options for every need. Their smallest plan is for only 3 photos a month, costing $29,99 –$9,99 per image–. You can hire it for just one month, so it works a lot like buying on demand (except you have a much tighter time frame to use your downloads). You can also opt for an annual plan of 10 images per month for the same price, taking unit price down to $2,99. Larger subscriptions are available too, improving the per-image rates big time. Starting at 40 photos a month for $99,99 and up to 750 photos for $249,99. When turning to annual hiring, prices go down to $79,99 and tops $199,99. This means you can buy photos for anything between $0.26 and $2.49 each! They sell image packs starting at $49 for 5 images of any size and resolution, which works at $9.80 per image. Their largest image pack is of $229 for 25 images, which equals to $9,16 per photo. Their subscription plans can be hired monthly or annually. Annual plans are cheaper, but billed monthly as well. They have options from 10 and up to 750 images per month, ranging from $29 to $249 a month depending on extension and volume chosen. This works out at as little as $0.26 per download! See more in our Shutterstock overview. As you can see, in terms of pricing, stock photo subscription is a much better deal, allowing you to buy lots of images for less than $0.50 each. Sure it requires to assume long-term liason with the agency, but the cost-benefit relation favours you: you're saving money and getting all the images you can possibly need. Single image purchasing is more expensive, but it's a good option if you are only testing the waters in stock photo buying, if you're not ready to commit to a subscription, or if you simply prefer to have full control over your expenses, and to decide exactly when to spend, and how much. This information was of great help to me. Congratulations and thank you!